American Farm was created in 1936 during the Great Depression by Joe Jones. This artists work fits perfectly within the time of the depression. It was based off of how the artist portrayed the depression to be. The painting is reflecting the distress of the Great Depression and how it affected families and there farms. Jones wanted to portray that as Noah’s Ark story where the barn and windmill, overlooking a ravaged landscape, have survived a disaster. Looking at this painting this is what I think the great depression might have looked like, the land all dried up and nothing to eat and no water. This painting would not be in my home it should be in a museum so people can learn about that time. 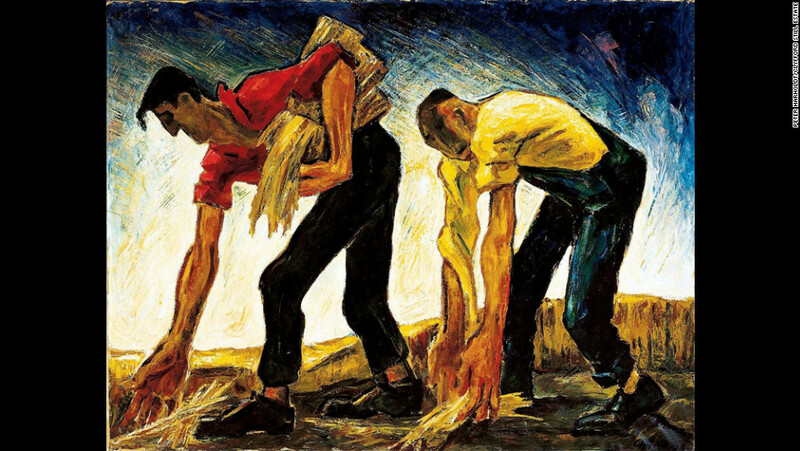 The Painting of Farmworkers is By Clyfford Still and is now held in the Clyfford museum in Denver, Colorado. He wanted to show the hard work farmer did in the depression and how hard it was. I think he explained that through the way he painted the arms of the men. He painted them like they dragged on the ground from tiredness and working in the fields all day long. Looking at this painting it makes me feel grateful that I am where I am today because of people like farmers who worked incredibly hard during times of need for the people of America. The coloring is very natural and the texture of the painting looks like pencil line instead of brush strokes. I choose the painting because I though I would match really good with my theme and I thought it was a very odd way of painting at the time. It is a complete different style from the other two I choose. Like the first one I think this is a great painting to have in a museum not my house. The Great Depression is something we all should learn about and be able to hopefully never live through again. This post was a good representation of The Great Depression’s influence on Early Modern art. It was a darker time for people and I think the paintings you chose really captured that darkness. 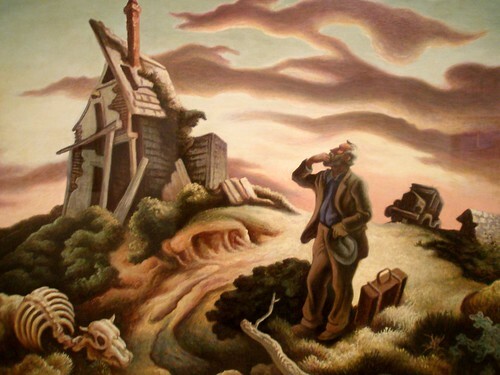 The last painting you chose by Thomas Hart Benton really caught my eye, because the lines and shaping reminded me as a cartoon almost and the color that was used was very similar throughout the whole piece. Even though it is simple, it still gives a back story of what it was like to live in that time period and to show the sadness of everyone and everything. Nice work. World of Wonders, Create a free website or blog at WordPress.com.